John Exter (A.D. 1910 – A.D. 2006) was an American economist, member of the Board of Governors of the United States Federal Reserve System, founder of the Central Bank of Sri Lanka, vice president in charge of international banking and precious metal operations for the Federal Reserve Bank of New York, senior vice president of the First National City Bank of New York (then the world’s second largest bank; now Citibank) and a member of Council on Foreign Relations. Mr. Exter was “connected” to banking. He worked the banking industry around the world and was equipped by education, intelligence and position to truly know how the “system” works. • Exter is best known for creating “Exter’s Inverted Pyramid”—a graphic used to illustrate the organization and comparative value of asset-classes measured in terms of risk and size. In Exter's theory, gold forms the Inverted Pyramid’s small base as the most reliable value. Successively higher “asset classes” are increasingly larger (in terms of nominal value) and increasingly risky. At the broad top of the Pyramid, investors may have almost no chance of being paid in full. Although gold is always at the bottom “peak” of Exter’s Inverted Pyramid, the other asset classes have varied in size and risk over the years. Exter's original pyramid (circa A.D. 1970) placed third world debt at the top as the world’s largest and most risky asset class. Today, however, the world’s $1 quadrillion in derivatives are deemed the largest and most risky asset-class. 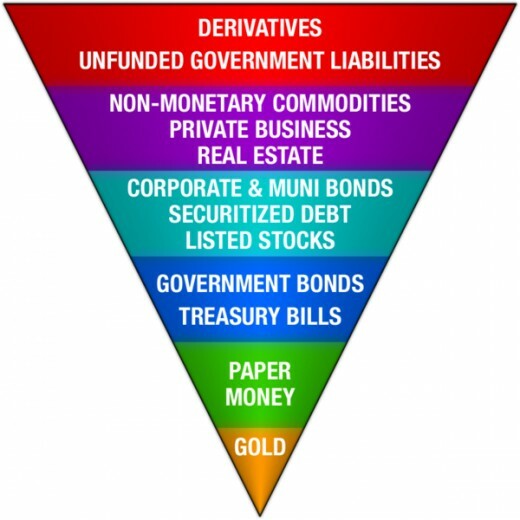 If I were designing my own “Inverted Pyramid,” I’d clarify that the “Gold” at the bottom peak was Physical-Gold, and I’d probably add another “asset class” between “Paper Money” and “Government Bonds” for “Paper-Gold”. Some might agree with my proposed modifications. Some might disagree. In fact, the size and order of the various asset classes is somewhat subjective. There’s room for some debate as to which asset classes should higher or lower. 1. Physical gold is the smallest, safest and most liquid asset class. Some might argue that paper dollars are more “liquid” (easily spent) than gold. I.e., I can walk into any American super-market with paper dollars and purchase a loaf of bread. If I walk into most American super-markets with a gold coin, I’ll probably have to get lucky before I can persuade any teller to accept gold for bread. Therefore, I may have to first sell my gold coin to a gold coin dealer so I can acquire paper-dollars to purchase the loaf of bread. Within the U.S., paper-dollars are more liquid than gold coins. However, I can take my gold coin to virtually any market on the globe and either buy bread directly or find someone willing to buy my gold coin for the local currency. There are places on earth where paper-dollars are no longer “good as gold” and increasingly disrespected. If you go to such foreign markets with a fistful of paper dollars, you might not find anyone willing to trade their bread for paper-dollars. You’ll always find someone willing to take gold in payment for bread or anything else. On a global basis, nothing is more liquid than gold. Besides, the Inverted Pyramid’s vertex not only measures “liquidity,” it also measures safety (store of value). Paper-dollars are subject to depreciation due to inflation. Today’s paper-dollars have lost 95% of their purchasing power since A.D. 1971. No such loss has been suffered by gold. Gold is more valuable than paper dollars. 2. As the remaining asset-classes are represented higher and higher on the Inverted Pyramid, they are also riskier and riskier. Two years ago, it was estimated that there were over $1 quadrillion in “derivatives” floating around the globe. Last I’ve heard, the size of the derivative market is now estimated to be around $800 trillion. In a world where the global GDP is $85 trillion, it makes no difference whether the derivatives total is $800 trillion or $1 quadrillion. There’s no way in the world that all of those derivatives can or will ever be paid. Dollar for dollar, Confederate money is worth more than derivatives. Those asset classes towards the middle of the Inverted Pyramid are less risky than derivatives, but still riskier than gold. 3. Virtually all of the asset classes other than gold are paper debt-instruments. Some asset classes are called “bonds,” others “stocks,” also “unfunded government liabilities,” “securitized debt,” “treasury bonds and even “paper money”—but most of these asset classes are paper debt-instruments and mere promises to pay. As such, most of these “asset classes” are only nominal “assets” in that they are based on debt (promises) rather than tangible reality. 4. In a debt-based monetary system, the amount of debt must continually grow. The debt-based monetary and banking system is a Ponzi-scheme. Thanks to fractional-reserve banking, a debt-instrument for $100 can be used as collateral for a bank to justify lending another $900 in credit. The resulting $900 in debt-instruments (promises to pay) can then be used as collateral to justify lending another $8,100 in credit, and so on. Thanks to the leverage provided by fractional-reserve banking, a small debt-instrument can be multiplied into seemingly spectacular amounts of loans. The fractional-reserve banking system works great—unless people begin to default on their loans/debts. Then, the same leverage that allowed $100 to grow into $900 and then $8,100, will allow a default on $100 in debt to cause the bank to call in $900 in loans which can cause another bank to call in $8,100 in loans, etc. If the number of debt defaults exceeds a certain presumed limit, the result can be a cascade of defaults, the destruction of many, most or nearly all of the paper debt-instruments that have been masquerading as “assets” and the vaporization of trillions of dollars of “paper wealth”. We saw this process play out in the home mortgage debacle of A.D. 2008. We have a debt-based monetary system. 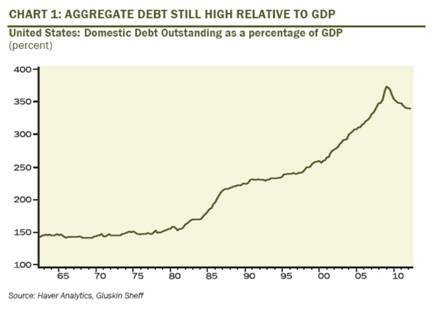 As seen in the chart below, after rising persistently from A.D. 1975 through A.D. 2010, the amount of US domestic debt has begun to decline. If Exter’s theory is right, the inevitable result will be an economic crash. 5. In the event of widespread debt default, investors will flee, even stampede, from the higher, riskier asset-classes in Exter’s Inverted Pyramid to the lower, safer asset-classes like cash and gold. As the riskier assets are abandoned and demand for gold soars, a little bit of gold will be able to buy a whole lot of stocks or bonds, land, factories or other asset classes that will one day regain their value. Implication? Those who are still holding gold when the Inverted Pyramid collapses will be able to make some incredible, once-in-a-lifetime buys. • Exter argued that whenever asset values are inflated and risk is perceived as low, currency moves up the inverted pyramid (away from cash and gold) into his Pyramid’s higher asset-classes. However, during a debt deflation, a panic, or a perceived high risk environment, currency moves down the inverted pyramid—towards cash and gold. That’s where we are today. In order to forestall the Inverted Pyramid’s inevitable collapse, the Powers That Be (“PTB”) will try to shore up the higher asset-classes in the Pyramid and attack the price of gold at the Pyramid’s bottom. Which is exactly what we see today. If Exter’s theory was correct, then we’re at the threshold of a deflationary depression. Exter: Since 1968 I had been recommending a 100% gold position. That has proven absolutely fabulous advice for those few who took it. . . . this present world-wide fiat paper money—what I call "IOU nothing" money—is going to break down. We’re headed for the worst economic catastrophe in all of history. MC: You make a point that is extremely important historically: since 8/15/1971 the entire world has been on an unbacked paper money system. That has never before happened in history. Exter: That’s why we are heading into such a catastrophe: the whole world has gone off gold. Without central banks, such a catastrophe could not be possible. Single paper currencies without gold backing have always collapsed, going way back to John Law in France, our own continental dollar, and the French Revolutionary assignat, all in the 18th century. That’s what my upside-down debt pyramid is all about. The debt burden at some point becomes unsustainable . . . .
MC: Exactly. . . . most people . . . saw our inflation ending in a hyperinflation. You have steadily insisted that our inflation would end in a deflation and a debt collapse. Exter: Yes . . . This will be a deflationary collapse rather than an inflationary blow-off because creditors in the debt pyramid will move down the pyramid out of the most illiquid debtors at the top of the pyramid—junk bonds, failing banks, savings & loans and insurance companies. Creditors will try to get out of those weak debtors and go down the debt pyramid, to the very bottom: currency (dollar bills), even though they pay no interest. . . . Creditors will move out of debtors high in the debt pyramid as many of those debtors fail through defaults and bankruptcies. That is very deflationary. Virtually all of the asset-classes in Exter’s Inverted Pyramid are paper “debt-instruments”. Gold is a real asset. The sum of these paper debt-instruments far exceeds that of gold and other tangible assets. The debts/derivatives are all promises to pay. The gold is a payment. Given that there might be over $2 quadrillion in promises (derivatives and public and private debts) for a world that has an annual GDP of perhaps $85 trillion, there’s no way that all the debts can ever be repaid in full. The majority of existing debts are irredeemable in that they’ll never be, can’t be, paid in physical-gold or any other tangible substance. They can only be “paid” by issuing additional debt-instruments—new and ever-larger “promises to pay”. It’s not just true that the higher levels “asset classes” in Exter’s Pyramid can’t be paid in gold, they can’t be paid in anything. Virtually all of the higher asset classes are lies, fraud, promises to pay that can’t ever be kept in full—but are absolutely necessary to feed the debt-based monetary system. If “consumers” lose their willingness or capacity to go ever-deeper into debt, then there’ll be no new debt-instruments to “pay” the existing debt instruments, and the fractional-reserve Ponzi-scheme will begin to collapse. The mathematical reality is that the upper asset-classes in Exter’s Inverted Pyramid can’t possibly be paid in full. Sooner or later, everyone will try to cash all of their upper asset-classes at the same time and we’ll see a debt defaults and a deflationary collapse. In the context of that deflationary collapse, the price of virtually all asset-classes will plummet while the purchasing powers of paper dollars (maybe) and particularly physical-gold (definitely) rise explosively. MC: What signs make you think we’re getting close to the collapse of the debt pyramid? Exter: The most important one is this flight to currency. . .• At some point people will go to gold. When they go to gold instead of currency or Treasury bills, the price of gold will take off. It will be a bandwagon everyone will want to get on. Then even those who have bought currency will see how foolish they were and that gold is far better to hold than currency, that it is the best store of value money man has ever found. It’s stupid for people to hold currency. The Fed can simply print all they want at very low cost. Paper money is as abundant as leaves on trees. People don’t realize that gold is money, the best store of value money that man has ever found over thousands of years. But, since WWII, Americans haven’t generally wanted a means to “store” whatever “value” or wealth they’d accumulated. In their greed for more currency, they forgot to protect the wealth they’d already acquired. They wanted to speculate. They wanted to gamble in expectation of “making a killing” and generating unearned wealth. In the pursuit of the seemingly “sure things” of investing in homes and stocks, Americans lost their memory and understanding of a need to “store” whatever real wealth they’d already accumulated. MC: You’re looking for a world-wide depression. How long will that last? Exter: It’ll be decades. This will be an economic catastrophe on a scale never before seen in history. We can see it coming now. . . . We’ve had more than three decades of heady expansion. We’ve now entered a merciless contraction from which gold is by far the best escape. • The higher debtors sit in the pyramid, the less liquid and riskier their investments. But if people lose confidence in those upper asset-classes, they won’t invest in them. If they won’t invest, they won’t create the new and additional debt-instruments required to feed the fractional-reserve Ponzi scheme. This is why the Federal Reserve has become the "buyer of last resort." No rational investor wants to buy any of the “toxic assets” like sub-prime mortgages of A.D. 2008 but now including US Treasuries (75% of which are being purchased by the Fed). So long as the someone (in this case, the Fed) continues to buy the upper asset-classes in Exter’s Inverted Pyramid, those “toxic” paper-debt instruments are still perceived to have some value—even though they’d be virtually worthless in a true free market. The Fed buys toxic assets (like mortgage-backed bonds or US Treasuries) in order to maintain the illusion that the upper reaches of Exter’s Inverted Pyramid are still somewhat valuable. This illusion is required to stem to tide of investors moving from the Pyramid’s top asset-classes to the bottom (physical gold). Similarly, the PTB are driving the price of gold down to discourage people from abandoning the higher, paper-debt-instrument asset-classes to invest in gold. The Fed is artificially supporting some of the top asset-classes and artificially suppressing the price of gold. From this perspective, it appears that Mr. Exter’s diagram and theory may be correct. If so, it also appears that we may be on the threshold of the deflationary depression that Exter predicted. • Ironically, as the PTB push the price of gold lower on US markets (in order discourage Americans from fleeing from paper debt-instruments and running to gold), the low, fire-sale prices are causing an enormous increase in gold sales in Asia. We can wonder if the enormous increase in Asian demand will ultimately foil the PTB’s attempts to suppress the rising domestic demand for gold. In fact, we can even wonder if the purpose of suppressing the price of gold in this country is intended to make it easier (cheaper) for the PTB to get out of paper-derivatives and move into gold. Are we seeing the price of gold suppressed to stop average people from moving from paper debt-instruments into gold? Or are we seeing the price of gold suppressed in order to make it easier/cheaper for the elite to abandon their paper debt-instruments and move into gold? We are certainly seeing a Gold War. I’ve watched the price of gold fall by over 30% in the past twenty months. In a true free (unmanipulated) market, there’s no rational reason to justify that price decline. Instead, it’s certain that this price decline has been largely orchestrated and caused by the PTB for their own self-interests and/or to sustain the fiat dollar and the debt-based monetary system illustrated in Mr. Exter’s Inverted Pyramid. The price decline in gold has annoyed me, disturbed me and even depressed me. At times, it’s almost shaken my confidence in gold as an investment. But in the last two days, gold’s price decline has finally made me mad. The sonsofbitches in Washington DC and on Wall Street are robbing me—and robbing you, too. Those of us with enough knowledge and courage to try to escape the world of paper-debt instruments are being plundered by the PTB. This is not a game. This is a g.d. WAR. OK. Thanks to Exter’s Pyramid, I get it. Finally. Since we’re at war, gold is no longer simply an “investment”. Gold is ammunition. Gold is the “bullets” in this war. Owning gold is no longer a question of whether we make a 20% annual profit or suffer a 15% annual loss. It’s a question of survival. Understanding that there’s a Gold War going on—not a misunderstanding, not a blip on the charts—but a WAR, complete with casualties, ruined lives and even ruined nations . . . and understanding that gold is no longer an investment so much as the ammunition that’s every bit necessary to my survival as bullets are to the survival of soldiers in Viet Nam, Afghanistan or Iraq . . . then, we can ask what is the true price of ammunition in a war? Sure, ammunition for your rifle might be selling for fifteen cents a round back at Walmart, but what’s that ammunition worth in the midst of a firefight in a war? It’s priceless. Same principle applies to gold. Gold is the basic ammunition in our current war with the PTB. You don’t dare sell it. You buy more whenever you can. I don’t give a damn if the price of gold falls to $1,000 per ounce. I’ll hold my gold just as Charlton Heston held his firearms. If the bastards want my gold, they can pry it out of my cold, dead hands. I’m sure John Exter would agree with that attitude. I was watching a TV documentary on orthopedic medicine in Germany . Why was public TV doing a documentary on that? Seems that there are an awful lot of knee and back surgeries overseas that are either unnecessary or are done by doctors that are not skilled enough to perform them. According to the report, in Germany orthopedic surgeries have risen 20% in five years. Why is that? The orthopedic field is very profitable and the way the German system is set up there is no incentive to avoid doing unnecessary surgeries. Germany has the universal socialized healthcare system. Surgeons get a flat rate for doing orthopedic surgery. So, if doctors want to make a lot of money they have to do a lot of surgeries. In 2011 there were 240,000 hip replacement surgeries, 175,000 knee replacement surgeries and 160,000 back surgeries done in Germany . The makers of the CPCC TV documentary interviewed former surgeons in Germany who did not want anything to do with the flat rate surgery arrangement the government forced on them. One orthopedic surgeon quit his hospital job and took a job as a first responder or what we'd call an EMT in America . He said that surgeons are under contract and under a lot of pressure in Germany The health authority has surgery quotas, which make patients a financial target. It has turned their medical industry into a reward or punishment situation for physicians. If doctors don't perform enough surgeries they are sanctioned and if they exceed their quota they receive a bonus. In Germany the socialized medicine has produced a high turn-over surgery rate and many patients are receiving surgery they don't need. Perhaps we have been looking at the socialized healthcare that is about to be launched in America the wrong way. We've been thinking that there will be substandard or no healthcare services. What if the universal socialized healthcare plan is to make every patient the doctor's paycheck. In other words doctors will be paid less money than before and have to work harder to earn the same money they are accustomed to. That system is not a reformed system and is not in the best interest of the patient. In Germany over 92% of the population is covered under the governments "Statutory Health Insurance." Their government controlled healthcare has been in effect since the late 1800's but was mostly for the very poor. More Germans were swept up into the government plan in the late 1970's making every patient part of a physician's meal ticket. Currently 50% of the 2,000 hospitals in Germany are public and their doctors are under quota contracts. Should you arrive at such a facility, former German surgeons say that you will have unnecessary procedures done. How many orthopedic surgeries are performed in America ? According to the CDC, we outperform Germany in the number of surgeries. In 2012 there were 719,000 knee replacement surgeries and 332,000 hip replacement surgeries. However, American has twice the number of hospitals than Germany .http://www.cdc.gov/nchs/fastats/insurg.htm Therefore, if the Affordable Care Act intends to pay physicians a flat rate as Obama says it will, it is estimated that the surgeons will have to do twice the number of surgeries as they are now to keep their standard of living. We will have to see how healthcare in American plays out but either way the healthcare pendulum swings will have significant impact on both physicians and patients. More and more people are deciding that they don't have time to wait to see how Obama's healthcare shakes out. They are working on their own affordable and preventable healthcare with healthier lifestyles and learning how to use medicinal herbs. People are discovering that with a few easy steps they can cleanse away toxins and power up their immune system to avoid many health problems. You can too. Call the experts in immune boosting and organ cleansing, call Apothecary Herbs now 866-229-3663, International 704-885-0277, online http://www.thepowerherbs.com, where your healthcare options just became endless. Request their free new 2013 catalog. Don't forget the Father's Day 15% discount special is on thru 6/21/13. Details are on the home page http://www.thepowerherbs.com,or mention coupon DAD613 with phone or mail orders. MORE HERB SECRETS IN THE POWER HERBS e-BOOK. By popular demand The Power Herbse-book is available with symptom/herb reference guide, information on organ cleansing and how to make your own herbal tinctures plus a whole lot more. Go here and click on Books. You must have email to order and receive the e-book a PDF version of The Power Herb book for just $14.99. At this time, we do not offer this title in hard copy. Also, more and more countries are refusing to allow our poison genetically modified food into their countries: http://www.examiner.com/article/what-countries-have-banned-gmo-crops. Yet, most Americans are hypnotized by tell-lie-vision, not questioning the self evident genocide of themselves that they are paying for. I have been saying for years that we are already dead if we do nothing, so it is time to grow a backbone, lose the fear and stand together to say NO MORE before it is too late. That is why I spend a large amount of time doing radio interviews and writing these newsletters: to arm you with the evidence that you can check out for yourselves, and share with anyone starting to wake up out of their mind control. You will note in this article that individuals with neurological issues such as autism and alzheimers (caused in the first place by bioweapon vaccines and toxins allowed to contaminate our food and environment) under this law will be allowed to give consent for euthanasia without parental/family input, despite the fact that their neurological damage by definition precludes them from being competent to give informed consent (not to mention that children are not competent due to their age in the first place). This genocidal policy (as expected in this world of "opposite day") is called "compassionate medicine". So maiming leads to murder; this is deemed "compassionate". I know that many of you have witnessed elderly love ones being surreptitiously murdered in hospitals and hospices with morphine induced respiratory arrest, mismatched blood transfusions and drug cocktails but now it will come out in the open and deemed "compassionate medicine". I predict a new medical specialty will be developed, to train psychopaths who would specialize in killing their patients how to obtain "informed consent" from individuals incapable of doing so, and then compassionately killing them. They will now be injecting humans with genetically altered caterpillar DNA. The combination of DNA from 2 species produces CHIMERAS (which I have talked about before in my newsletters). Additionally, the injection of these foreign tissues will lead to an increase in life threatening insect allergies, just like putting peanut oil in vaccines has led to life threatening peanut allergies, usage of dog kidneys in vaccines has led to an increase in dog allergies, etc. Note that this insanity has already been approved by the FDA! As I have warned people for years, they are altering our very genetic structure with these bioweapon vaccines and creating a nation of chronically ill, lifetime customers for big pharma. This is a very important article, as they are admitting that breast cancer is caused by a VIRUS (as I learned from decades old documents from the SPECIAL VIRUS CANCER PROGRAM started by Nixon). This program has created many viruses that cause cancer; and just like the HPV vaccine is massively spreading the HPV virus, this breast cancer vaccine will do the same.